The Merax RB1020 recumbent bike falls in the same budget category as the Sunny SF-RB4601 or Marcy NS-716R. It has been available since 2017, so it’s a relatively new model. So far, it has received quite a positive feedback from most users, and therefore, it’s definitely a recumbent bike to put on your list if you’re looking for an affordable one. The Merax RB1020 features a frame made of steel tubing, designed to support users up to 245 lbs (111 kg). Several websites mention a weight capacity of 380 lbs (172 kg) for this bike, which is incorrect. Most other exercise bikes with this type of frame construction have a weight capacity between 220 lbs (99 kg) and 275 lbs (125 kg), so this bike most definitely won’t support loads up 380 lbs. Such weight will probably damage the seat’s slider if not its whole support bar. So, to be clear, the bike’s maximum weight capacity is 245 lbs (111 kg). 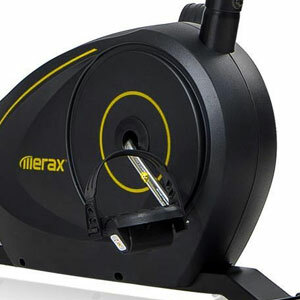 As we’ve mentioned above, this Merax exercise bike can be compared with the Marcy NS-716R. However, as opposed to the Marcy model, it has a one-piece chassis, its seat having a sliding adjuster. The fully assembled unit is not extremely heavy; it weighs approx. 51.1 lbs (23.1 kg), so its assembly, transport, and handling shouldn’t be too difficult for most users. Plus, its front base is equipped with transport wheels which considerably ease its relocation. The rear base features rotating polygonal caps which serve as stabilizers. This recumbent exercise bike isn’t extremely large. Its base measures approx. 48″L x 20″W (122 x 51 cm), but with the seat extended all the way back, its full length reaches a length close to 58″ (147 cm). Also, the width of the seat handlebars is approx. 25″ (63 cm). On top of that, it’s recommended to leave at least two feet of clearance all around it, for easy entry and exit, and safe operation. One last aspect to mention here regards the bike’s paint finish. Most of the steel bars within the frame construction feature a black powder coating, rust-resistant, and chip-resistant. The only metallic parts with a chrome finish are the crank arms. The Merax recumbent bike RB1020 is equipped with an ergonomic seat, featuring 2″ of foam cushioning on both the seat and the backrest. The upholstery is made of a durable vinyl material. The seat is fairly large; it is approx. 16″ (41 cm) wide, and 13″ (33 cm) long, designed to provide optimal comfort. The whole seat assembly is adjustable; it slides on an oblique rail and you can lock/unlock it with the lever on the right side. 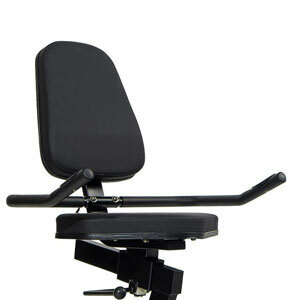 The backrest doesn’t recline, and you cannot adjust it in any way independently from the seat. It moves along the rail along with the whole seat frame. It’s approx. 12″ (31 cm) wide and 16.5″ (42 cm) long, and provides an excellent lumbar support. This exercise bike has two sets of handlebars, one at the front, on the console mast, and one attached to the seat assembly. The front handlebars have a simple, straight design, similar to the Sunny SF-RB921. The seat handlebars are equipped with pulse sensors, so by holding on to them the bike’s exercise meter can monitor your heart rate. Both sets of handlebars are covered by a layer of rubber foam material in order to provide a secure grip and optimal comfort. The Merax RB1020 recumbent bike features a manual magnetic resistance system. This means you don’t have to connect it to a power source. 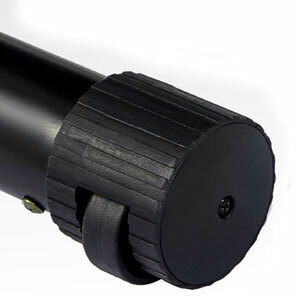 Its resistance system consists of a small magnetic pad attached to the tension dial on the console mast through a steel cable. By turning the dial, you can adjust the position of the brake pad in relation to the flywheel which results in more or less pedal resistance. Evidently, since the brake system is magnetic, it’s the magnetic field that creates the resistance; the brake pad and the flywheel don’t touch, so there’s virtually no wear and tear in-between them. The bike offers 8 levels of resistance. 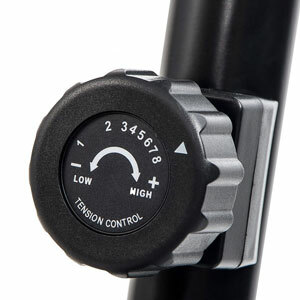 The first 1-2 levels deliver a very light pedal tension which is great for recovery training. But on the other hand, the top 7-8 resistance settings considerably improve tension, giving you the possibility to undergo a more intense workout, great for stamina and leg muscle strength development. Since this Merax exercise bike is equipped with a magnetic resistance system, it uses a belt drive system. The transmission between the pulley and the flywheel is supported by a heavy-duty, stretch-resistant rubber belt. And since it’s a belt drive, not a chain drive, it generates less vibration during pedaling, it’s very quiet, and does not require lubrication. The bike integrates a perimeter-weighted flywheel. Its weight is not specified, but since the overall weight of the bike is only 51 lbs, the flywheel can’t be too heavy. In other words, it’s weight should be around 8-12 lbs (3.6 – 5.4 kg). The flywheel is bi-directional; this means you can pedal in reverse if you want. This allows you to put some diversity into your workouts. Also, when pedaling in reverse, the exercise meter should continue to count your workout stats, and the resistance should not change, depending on the setting that you have selected on the dial. This exercise bike is equipped with a 3-piece crankset. It features solid steel crank arms with weighted, self-leveling pedals. Each pedal has an adjustable strap for maximum foot stability and a non-slip surface. 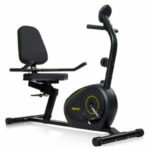 This Merax exercise bike is a basic model, so the fitness meter supplied with it is also a basic unit. It can track time, speed, distance, total distance traveled, calories, and pulse. The distance is counted in miles, while the speed is calculated in miles per hour. 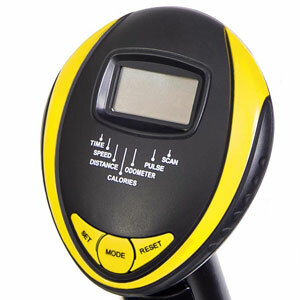 For pulse reading, you have to hold on to the sensors incorporated into the seat handlebars; the unit cannot read pulse via Polar HR chest strap transmitters. There is no user data input available on the meter. In other words, you can’t input your weight or age, so the calorie consumption displayed by the unit depends strictly on the number of flywheel rotations. Thus, it is not being extremely accurate. A countdown function for time, distance, and calories is also available. You can set up a target value for these workout metrics, so the unit will begin to count down from it until it reaches 0. The unit uses a “SCAN” function to rotate the workout stats, displaying each one for a few seconds. It starts up when it detects pedal movement or when you press one of the buttons. It also shuts down automatically after several minutes of inactivity on the bike. It uses a set of two AAA batteries, which are included. The bike’s base frame along with the drive and resistance components comes already assembled. Therefore, you only need to attach the console mast, the seat, the backrest, the seat handlebars, the console, and the pedals. This shouldn’t take more than an hour. The manual provides clear step-by-step assembly instructions, and a basic toolkit for assembly is included. Maintenance requires to check the machine’s bolts and joints periodically and re-tighten them if necessary. The internal parts come pre-lubricated and shouldn’t require any lubrication for a long period of time. The calories reading on the meter is not too accurate. The Merax RB1020 is a basic recumbent exercise bike meant for home use. It offers 8 levels of manual magnetic resistance and comes with a basic console. It has an adjustable seat, with two inches of foam padding, a large backrest, and a sturdy frame construction. It’s an exercise bike for beginners, great for light cardio workouts, stamina training, recovery training and weight loss. It’s also one of the most affordable recumbent bikes and does offer excellent value for the price.